Those auditioning may do so either on Sunday 9/16 or Tuesday 9/18. Bring appropriate clothes and shoes for the dance portion of audition. Please bring any of the following footwear that you have - tap shoes, character shoes, jazz shoes. Come prepared to list all conflicts you have during the rehearsal and production period of Sep 19 through Dec 16, 2018. 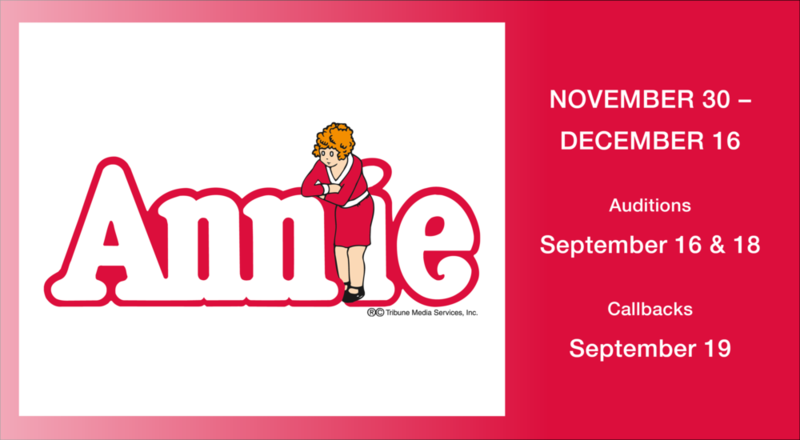 Auditions are open to those ages 8 and older. Rehearsals will typically be held Sunday-Thursday in the 6-10pm time frame. Some rehearsals will be held earlier in the day based on the availability that actors list on submitted conflict schedule. Additional rehearsals (including Fridays & Saturdays) will be scheduled as needed. Not all cast members will be called to every rehearsal. Rehearsals will run longer and potentially later during Tech and Dress Rehearsal weeks.